Microsoft unveiled Internet Explorer 10 – they showed it off at the MIX11 developer conference, which started yesterday at Las Vegas. 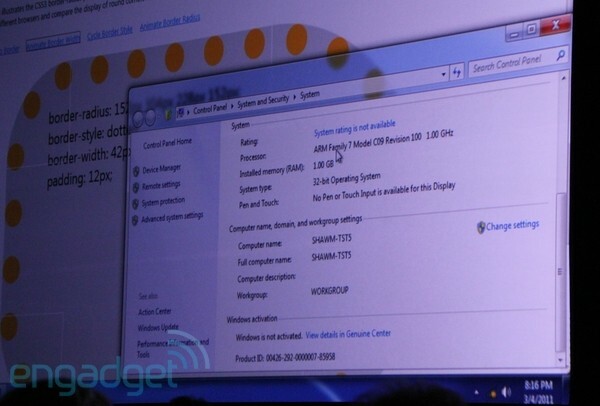 They did a demo, with Windows and IE10 running on an NVIDIA Tegra platform (with ARM processor). Yup, that’s W-i-n-d-o-w-s on an ARM CPU. The first Platform Preview of Internet Explorer 10 is available for download. Wait, didn’t I just test IE9 last month? Alright, the bigger the version number, the merrier I suppose… You can ask Google, they’ll confirm. You can grab a copy of Internet Explorer 10 Platform Preview from here (it works on regular desktop PCs). I did and took it for a quick spin – it’s far from ready (there’s just enough chrome on the UI to let devs test it) but it’s good for a few benchmarks. The new version of Internet Explorer promises much better support for HTML5. Hardware acceleration has also been improved. But of course, the biggest news is that the browser and Windows 8 itself run on ARM processors – 1GHz NVIDIA Tegra 2 in particular for the demo. By the looks of it, Microsoft’s ARM tablet plans are going full steam ahead. Now, a few quick benchmarks including the IE 9 and IE 10. Both IE browsers showed no difference in the Acid3 score (95 in both cases). I also ran one of the graphics acceleration benchmarks (Paintball) and even on my anemic video card Internet Explorer 10 went nearly 3 times faster. The CSS test results were vastly different too – here’s what they look like under IE9 and IE10. Internet Explorer 10 is not yet usable as a primary browser but what impressed me was Microsoft’s renewed commitment to get back in the browser wars and they are rather quick at it. It makes you wonder… why the stall in the first place?